This book did not disappoint. The cover art drew me in and the whole way through it was consistently gorgeous work! 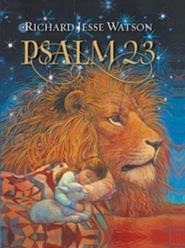 It goes through the 23rd Psalm line by line illustrating each line with something child appropriate. Most of the pictures include depictions of children happy and peaceful as the Psalm reflects. At the end the entire Psalm is written on the back page. I love this book! Highly recommend for every child. It's important for children to grow up feeling safe and this book, through the images and the words, definitely promotes that. Would also make a great gift. Please note: Booklook sent me a free copy of this book for review. This review is my own.